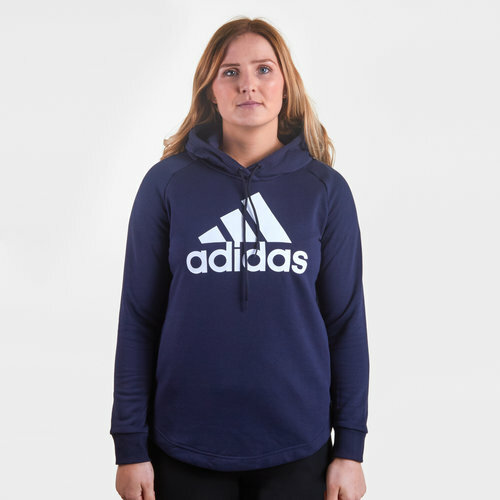 A comfortable, relaxed style that's sure to help you unwind, pull on this adidas Ladies Logo Hooded Sweat in a Legend Ink and White colourway. This comfy hoody from German sports brand adidas has been crafted to add warmth on the colder days. Reward yourself with the comfort of a soft French terry hoody after you've smashed the gym or after you've killed it at work, either way, relax in style. This hoody has been crafted in an elongated length for extra coverage against the chill. It is feminine but sporty and has been finished with a prominent adidas logo across the chest.